Shopping for a new car is an exciting endeavor, and the experts here at Venice Toyota are standing by to assist you with this quest. Thanks to incredible advancements in technology, finding a quality, safe vehicle is a breeze. If you’re looking for car to handle your family’s needs, or need a commuter car that can help cut down on fuel costs, the 2016 Toyota Corolla should be on your list of options to test drive! The Corolla has powerful safety features, impressive design elements and technology features to deliver you to your destination in comfort. Our convenient Florida dealership will listen to your driving habits and suggest some available add-on features to make your Venice life run a little bit smoother. There’s no need to wait to begin your search, thanks to our online inventory system where you can browse through all the available options. Find a Corolla that catches your eye? Don’t forget to schedule an exhilarating test drive to see how the Corolla handles your needs! Our team is standing by, ready to lend a helping hand so give us a call today! The 2016 Corolla comes standard with eight airbags, all designed to provide head to toe protection. The knee and front passenger seat-cushion airbags ensure that your head and torso aren’t the only things being protected in the rare occurrence of a head-on collision. The Whiplash-Injury-Lessening design of the front seat works to ensure your safety in a rear end collision. The Toyota technicians understand that accidents can happen from all angles, but now you can breathe a bit easier knowing your Corolla has been built with you in mind, providing comfort and protection from as many angles as possible. The included Star Safety System works to eliminate the occurrence of any accident, by providing an array of braking and traction features. All these elements add up to mean one safe, reliable vehicle that you and your family can trust. Take a test drive today to have a team member go over all the safety specifications available and start customizing your Corolla now! With an EPA-estimated 42 highway mpg, you’ll be able to take those long road trips you’ve been putting off. We’re all about choices here, so come see the available trims and the standard features of each! No matter which trim you choose, the fuel economy will help keep money in your pocket! In the market for a commuter vehicle? The EPA-estimated 30 city mpg can handle those work needs! You’ll stop for a gas fill so infrequently you may forget how to do it! Now you can enjoy the freedom of the open road without being consumed with worry about how far the next station is; relax and take in the scenery with the 2016 Corolla. Stop by today to have a team member walk you through each trim so you can make an informed decision on which model works for you. We look forward to getting behind the wheel of a Corolla just as much as you do, so be sure to schedule a test drive today! The technology of the 2016 Corolla is sure to put a smile on your face. Start your trip off with the Smart Key System that enables you to start your Corolla with the push of a button. The available backup camera can help guide you out of that tight parking space and as you hit the road, be sure to open up the moonroof to fill the Corolla with some fresh air as you leave the driving up to the cruise control. The available 3.5-inch multi-information display will work to show any pertinent information you choose, like how many miles you’ve traveled, including the average mpg. Your car keeps track of important information so you don’t have to. Driving is now enjoyable, thanks to the available technology of this Toyota. If it gets a little chilly inside with the open moonroof, the automatic climate control will help to warm you right up. The Corolla’s design helps you keep your focus on the road ahead, and with the mounted steering wheel controls, it is easy to do just that. With the push of a button you can make a hands-free call using your Bluetooth paired device, or opt for the Voice Recognition software to talk to your Corolla all you want. The Entune Premium Audio with Integrated Navigation system helps deliver you to your destination while listening to your favorite tunes, so head over to Venice Toyota to see all you’ve been missing! 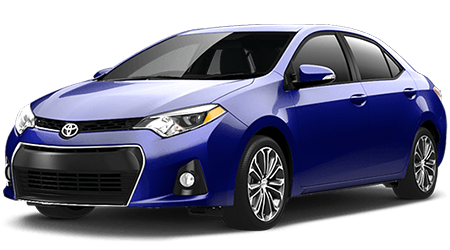 The 2016 Corolla is a luxurious addition to the family that commands attention while the aerodynamic body enhances the vehicle’s fuel efficiency and handling. Cruise around on 17-inch alloy wheels while the LED headlights guide you through that thick morning fog. The cargo space will hold an impressive amount of luggage, so go ahead, bring that extra overnight bag. Needing a little more room to fit those mountain bikes in? The 60/40 seats are here for you! Fold them down in the most convenient configuration for what you’re looking to accomplish, and hit the road with the satisfaction of knowing you’re bringing all the equipment you not only needed, but wanted. As you slide behind the wheel, your attention will go to the fluid dashboard that accentuates the center console. The sleekness of the vehicle never gets old and you’ll quickly find yourself volunteering for those errands; anything to get back behind the wheel of your Corolla. Make the short trip over to Venice Toyota to find your 2016 model today! The 2016 Toyota Corolla is available now for a test drive at our convenient Venice location. We welcome all our neighbors and look forward to welcoming the residents from the nearby cities of Bradenton, Sarasota and Punta Gorda. Our customer service doesn’t stop after you’ve driven off in your new Corolla, talk to us about our service and parts department so we can keep your ride running smoothly and check back on our site frequently to take advantage of any service and parts specials! Start your search now using our online inventory page and be sure to give us a call to schedule a test drive or use our online form to book an appointment! We eagerly await your arrival.